On to my next category of summer purchases: earrings. I absolutely love earrings. My lobes are stretched to disgusting Kris Jenner lengths from all my years of wearing hoops the size of my upper arms. My philosophy is that if something isn't brushing my shoulders, it's understated. With that in mind, I've been in the market for some understated earrings and the following fit the bill. These earrings are from Baublebar and I lusted over them for almost a full calendar year before finally purchasing them. I think their original price was something outrageous like $60. Completely outrageous for earrings. I'd drop $60 on an eyeshadow palette as an impulse buy and not even blink and eye. Earrings, though? Are they going to tell me jokes and wash the dishes for me? I have a great relationship with fiscal responsibility, as you can tell. Luckily for me, Baublebar had a pretty bananas Labor Day sale and dropped the price of these to $20. Even then I was psyching myself out about getting them but I'm so happy I did. They took them off the site after the sale (sorry for always blogging about unavailable things) and I would have hated to miss out on these. They're even more gorgeous in person. 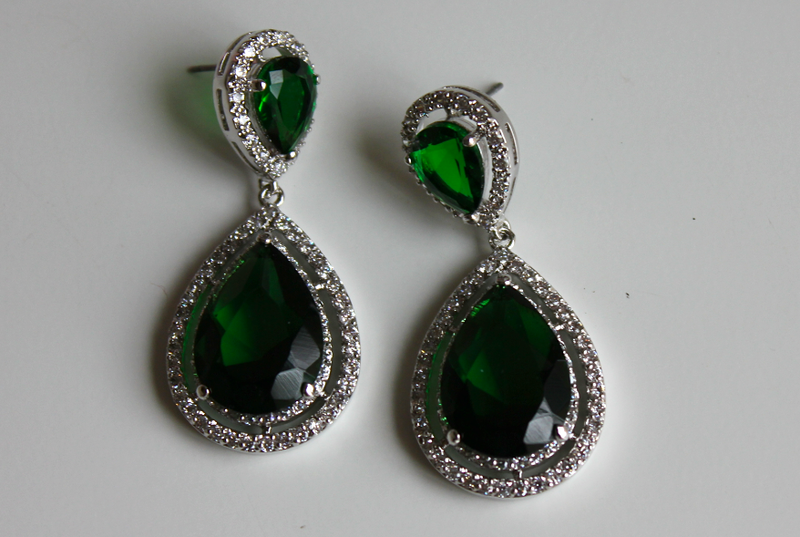 Initially, I planned to channel Angelina Jolie at the 2009 Oscars with these earrings. Pair them with understated black dresses (more in the vein of H&M than Elie Saab) and big hair and really let them shine. They were available in green, purple and a clear stone and I picked the green solely because of how much I love this look. 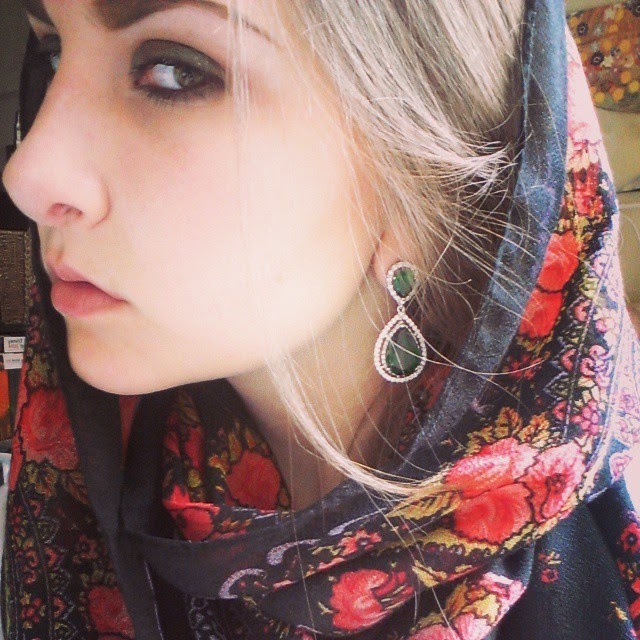 Now that I have them, they remind me more of something a member of the Russian Imperial family would have worn. I think that's the vibe Baublebar was going for since they were named "Anastasia Drops" when they were still up for sale on the site. And obviously I love that vibe way more. Look at what I named my blog. These earrings are part of my personal brand. 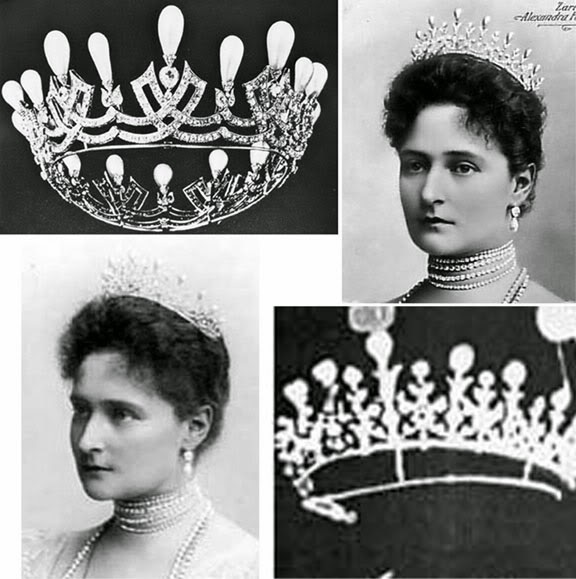 Yes, I am also in the market for a Cartier tiara. I'm wearing them as I type with one of my favorite scarves and it makes me feel like I'm a Russian empress disguised as a peasant or something. They really feel like something Tsarina Alexandra of the Romanov dynasty (shown above) would have worn. When her husband, Nicolas II, finally popped the question to her she almost immediately began receiving letters from her future mother in law asking if she liked emeralds or sapphires better so the royal jewelers could start churning out things out for her right away. She was my age, around 22/23, at the time so that's the pretend life I'm living when I wear these. Minus the whole getting married and pregnant thing and (hopefully) the ominous future that includes getting gunned down along with your children. I'm just all about this look. These earrings feel really special and over the top for everyday use but it's who I am. They've held up really well considering how much I've been wearing them since they arrived in the mail. I was originally worried I'd be losing stones left and right but they seem pretty sturdy. Their original $60 price tag is even starting to seem justifiable. I'll definitely be less trigger shy the next time I see something I love on Baublebar. 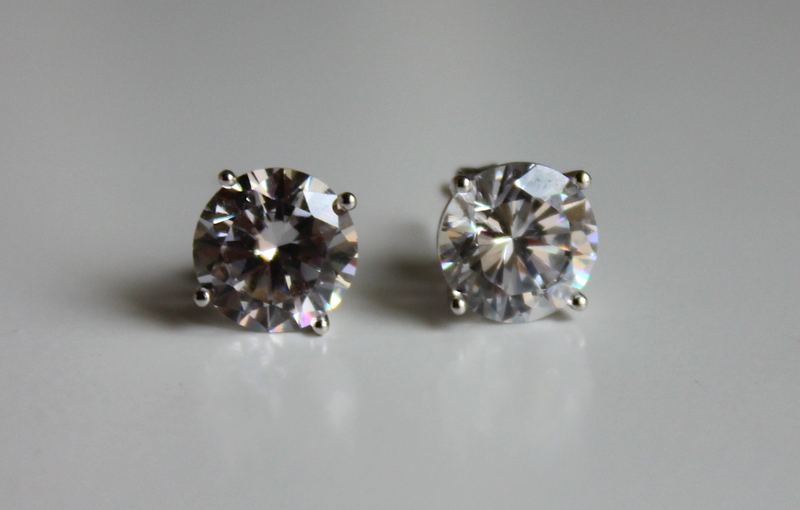 Next, I picked up these cubic zirconia studs from Nordstrom Rack. A woman who was pursuing the jewelry with me looked over these studs with disdain saying, "Cheap, cheap, cheap" to either me or herself. Cheap is also kind of my aesthetic so her input was really helpful for me. These are just huge, obviously fake studs that are super sparkly. I guess judging from my fellow shopper's opinion no one is going to be convinced they're diamonds which I know is unbelievable. How could a girl wearing leggings as pants and Target shoes while working as a nanny NOT be wearing real gigantic diamond studs? It will be a hard truth to swallow. In actuality, I felt this was a practical purchase. I own very few stud earrings because I usually opt for giant hoops or chandeliers. I usually go bare on the days my ears need a break from my 5lb earrings. Just all for lack of any boring stud earrings. So, I pushed myself out of my comfort zone and got some low key studs that I can wear when I'm spending the day cleaning or going to the gym. I'm pretty sure Jennifer Lawrence's character in American Hustle was based on me, just with the inclusion of a bit more velour. 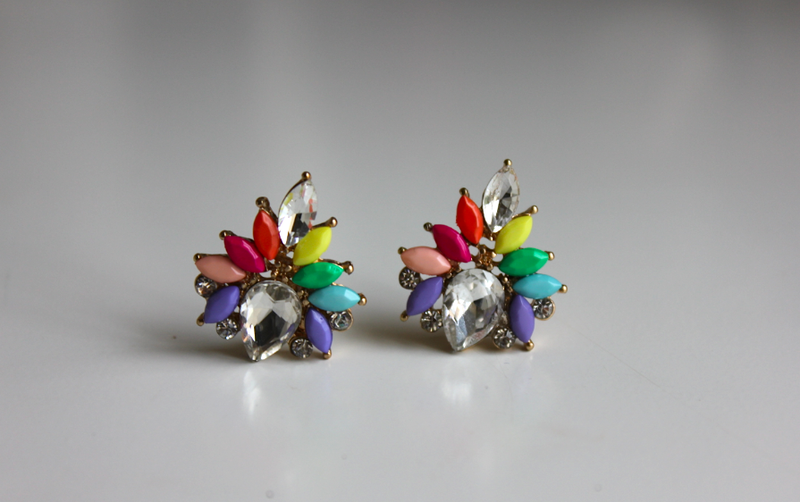 Finally, I picked up these rainbow studs to add color to my blander outfits. Why just go for adding some color when you can add every color? I had a black and rainbow printed dress in mind when I actually purchased these but I think they're a lot better suited to amping up plain white shirt and jeans combos. I'm now deliberating avoiding Nordstrom Rack. Their jewelry section at their Friendship Heights location in DC is just crushing it. My wallet can't take it and my heart barely can either.